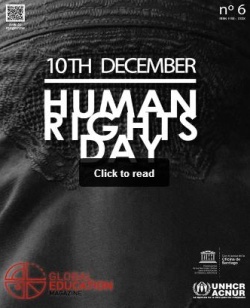 EUROCLIO would like to draw your attention to the latest edition of the Global Education Magazine, which is honouring Human Rights Day (December 10). The Global Education Magazine is an educational magazine with an international character that seeks to promote ideas and experiences from the work of educational professionals, as well as NGOs, Voluntary Associations, Supranational, National, Regional and Local Institutions and Organizations. This edition also features an article by EUROCLIO on its programme Historiana, including a call for contributions to the programme. The magazine is already accepting articles for the next edition, focusing on International Women’s Day (deadline January 30).